Here you will find a complete list of courses offered at UBC iSchool, organized by program and subject area. Each title links to the individual course page where you will find more details about the course and requirements. For a list of courses being offered this term, visit our Timetables page. The D/E sections of this course code are used to indicate WISE Courses. Students in the MACL program should consult the MACL "Courses" webpage for details on approved courses. Elective courses other than those designated ARST (for MAS students) and LIBR for (MLIS students) may be applied to the program, whether taken at UBC or another institution. External courses may total no more than 12 of the 48 credits required for the MAS or MLIS degree. Elective courses other than those designated ARST and/or LIBR may be applied to the program, whether taken at UBC or another institution. External courses may total no more than 9 of the 81 credits required for the Dual MAS/MLIS degree. All courses external to the degree program must be at the 300-level or above (or the equivalent at another institution). A maximum of 6 credits at the undergraduate level in courses numbered 300 to 499 may be counted toward the requirements of a master's degree. Students completing the First Nations Curriculum Concentration are allowed a maximum six (6) credits of approved First Nations coursework at the 300- or 400-level in their Master’s degree program. Permission to apply such a course for credit towards one's degree must be obtained from the iSchool Graduate Advisor before the student begins the course. The granting of permission will be based on the course's direct relevance to the student's work in their program. Students must complete the Application for External Credits Form. Permission must also be obtained from the instructor of the course and the host department/institution. Some fees may apply for courses taken outside of the department and/or university. Students should consult directly with the hosting department/institution. UBC has exchange agreements with some post-secondary institutions through the Western Dean's Agreement, the Graduate Exchange Agreement, and the Go Global program. Some courses are listed in the UBC Calendar with a choice of credit value. This permits the School to offer several different courses in the same area of specialization carrying the same course number. The form (3-9) indicates that courses within a specialization group number may be taken more than once for credit (with different content each time, as designated by different letters following the course number, and worth 3 credits each time). Within a specialization area, a letter differentiates the courses, e.g. 575A. 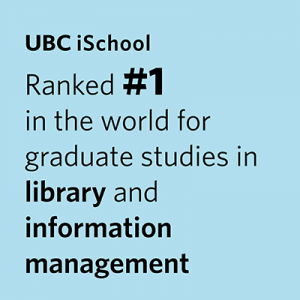 Courses at UBC iSchool are worth 3 credits.